We get caught up in daily life that we forget to live. While scanning through Facebook I noticed an obituary – he looked young. He was – 42 years old. I wondered if I knew him. So, I clicked on the link. Stop and take a breath. Appreciate life around you. Live. We all know what to do. Are we doing it? In the comment box below, share with others. Your ideas may inspire someone. Put a note about something you did. It can be a couple of words – hugged your child, breathed in the fresh air, appreciated a flower, smiled at a stranger… share anything at all. 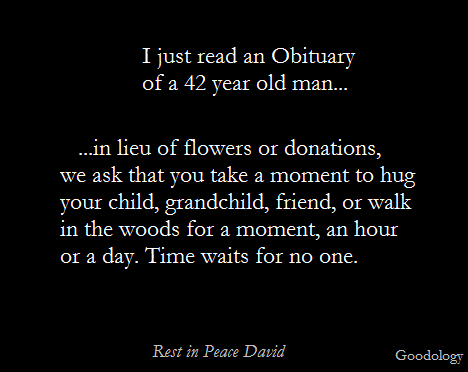 This is the link to obituary for David. Previous articleDoctor Delivers Babies with Great Love – and Song!